Now… you’re stuck with deciding what to wear. It’s a big day and you don’t know what to wear. 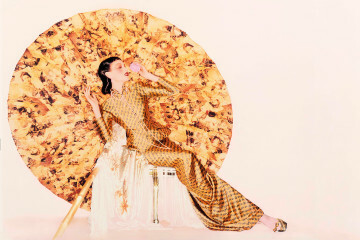 You want to look good yet stay within the rules of graduation wear. 1. The new graduate looks lovely in this blue outfit. A plaid dress shirt, grey shoes, and black belt. The wrist-watch, textured skinny tie, and socks complete the look. A silver tie pin holds the tie in place. Graduates wear a robe over their outfits, so unrolling the sleeves on this outfit will make it perfect for a graduation outfit. 2. A clean, classy and formal look. A dark grey Satin tie with matching trouser and purple shirt. Complete with a tie pin and a black belt. The sleeves are rolled up for an informal look. Roll down the sleeve to wear underneath your graduation robe. 3. Another excellent outfit idea for the new graduate. 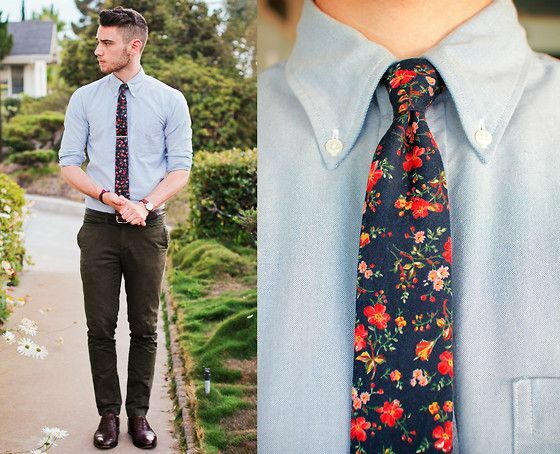 The floral tie and rolled up sleeves makes the appearance semi-formal. 4. 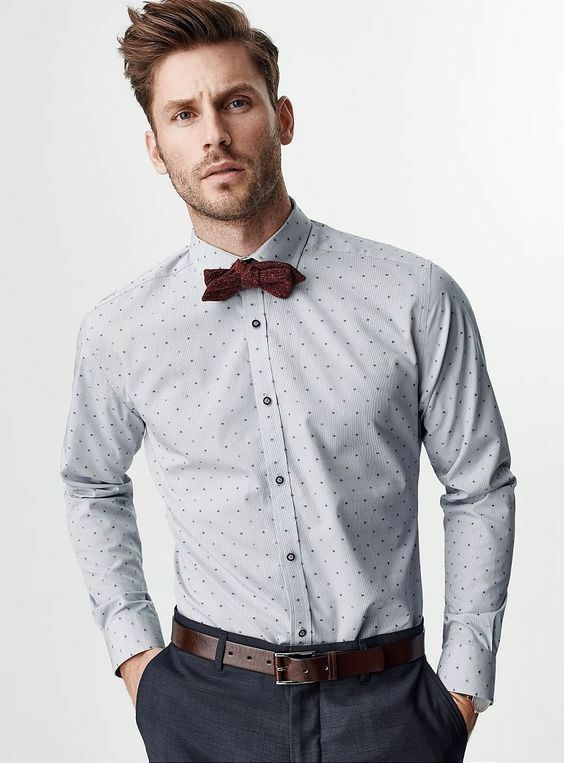 The rugged graduate in maroon bow-tie, polka dotted shirt, and matching belt. The shirt is simple, creating the perfect balance. 5. A simple white cotton shirt and gray cotton trousers with black shoes. The new graduate can look good without a belt as well. Super stylish. 6. The classy university look. That’s a simple, formal graduation dress. You can never go wrong with this one. 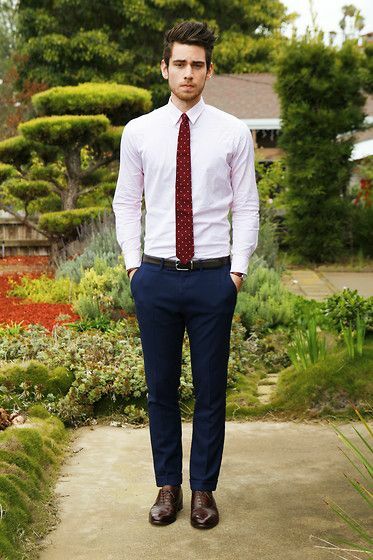 A red polka-dotted tie, pink dress shirt, blue trousers, belt, and brown cap-toe style Oxford shoes. 7. More hip, more stylish! 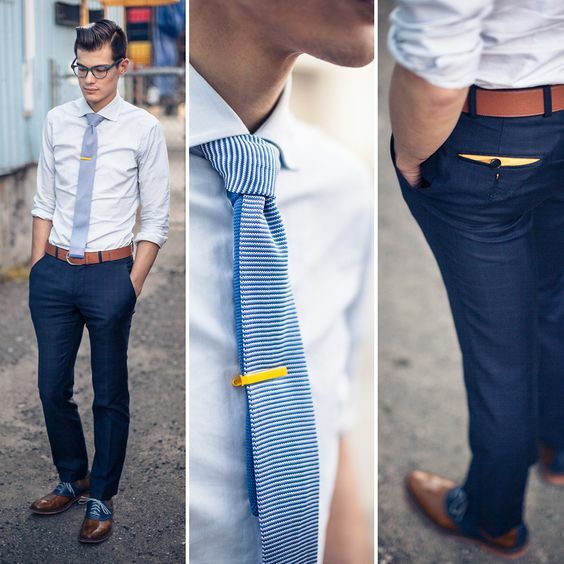 The blue band in the shoe goes well with the trouser and adds spark to the outfit. A yellow tie pin, light brown belt, and light blue tie. 8. Super preppy! 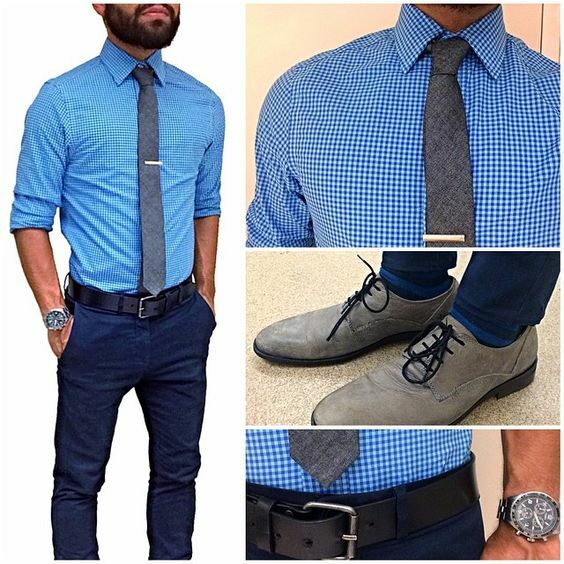 A smart blue check shirt, but what stands out is the watch and matching shoes. A different look, one that makes him stand out easily. Wear with a black tie or any colored tie to complete the look. 9. Ready to go to work. The straight lines add to his personality. 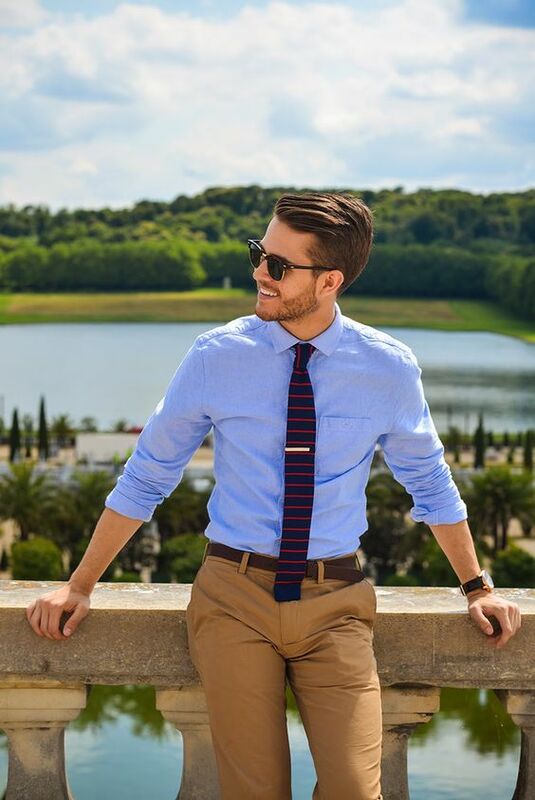 A striped club-collar dress shirt, blue trousers, blue tie to match the pants, and a brown belt. 10. 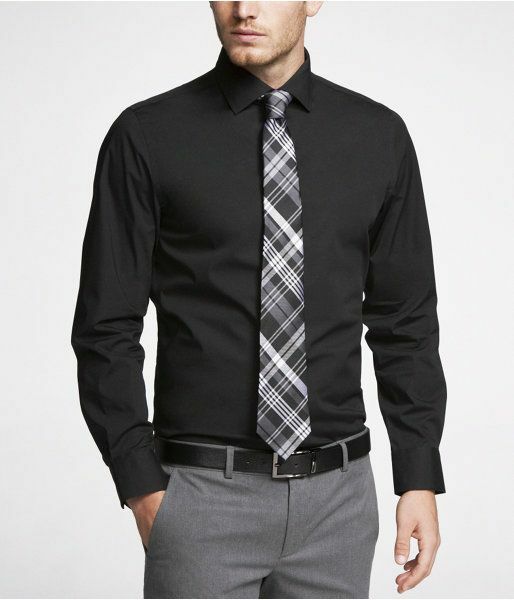 Black full-sleeve shirt, matching black and white plaid tie, and gray cotton pants. It’s a regular formal outfit but one that always looks good. 11. When you wear brown shoes, make sure that it goes well with the color of your shirt. The brown shade is always trickier. This purple dress shirt and blue trousers also work well together. If you’re going to wear brown shoes, make sure to match it with a brown belt. 12. Classy nerd style graduation outfit. Perfect if you’re graduating in the winter. 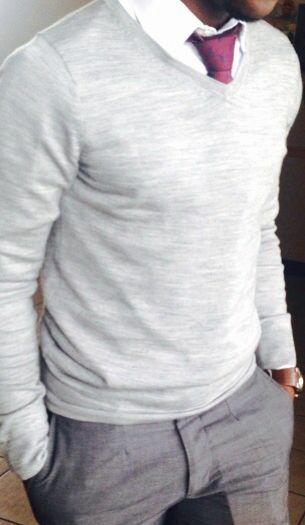 A simple light grey colored cardigan, buttoned-up, with black pants and white shirt. This graduation outfit will help keep you warm when walking across the stage. You can try a different color for the tie. Complete the look with a brown watch. 13. This could be the perfect outfit if you are graduating in the winter. No one can complain about this outfit. Brown cap-toe boots, brown belt, a dress watch, brown sweater vest, collared dress shirt, and a blue tie to match the trousers. 14. Another brilliant winter graduation outfit idea. The canvas shoe can be perfect for semi-formal gatherings. 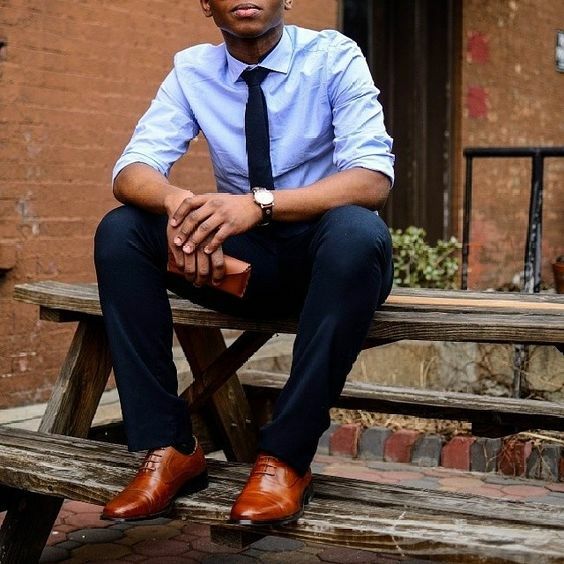 Navy blue trousers to match with the navy blue blazer jacket, light gray sweater vest, collared dress shirt, and tie to complete the graduation outfit. 15. 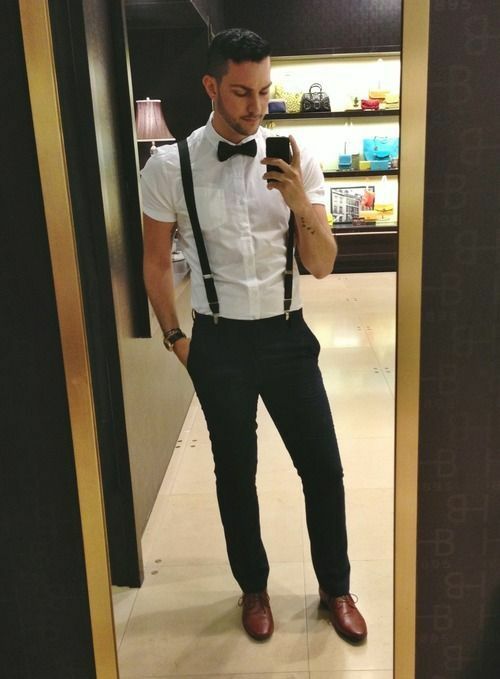 A new graduation outfit – complete with black suspenders, and bow-tie. 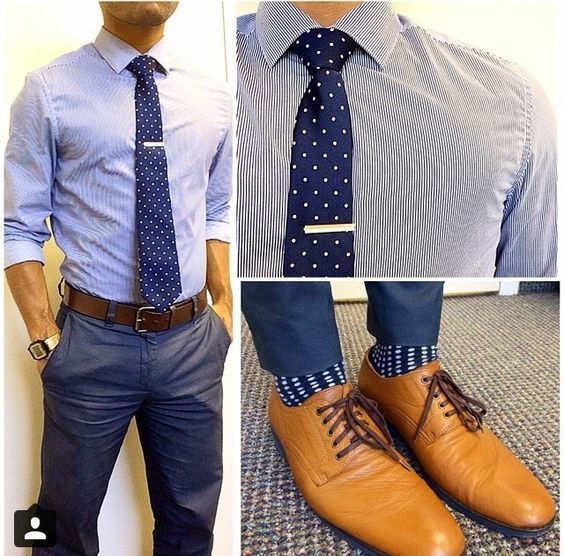 You can change the strap and go for a different color, but match it with the tie. Brown oxford shoes, black watch, and short sleeved white collared dress shirt. Wear this in the summer if you’re going to be graduating outside in hot weather. 16. Check gray plaid shirt, black trousers, black belt, and a gray polka dotted tie. 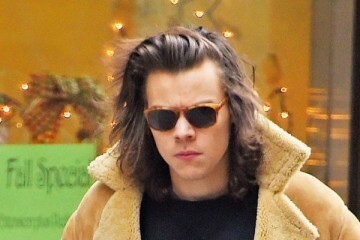 The man looks smart, trendy and handsome. Roll down the sleeves for a complete formal look at graduation day. 17. 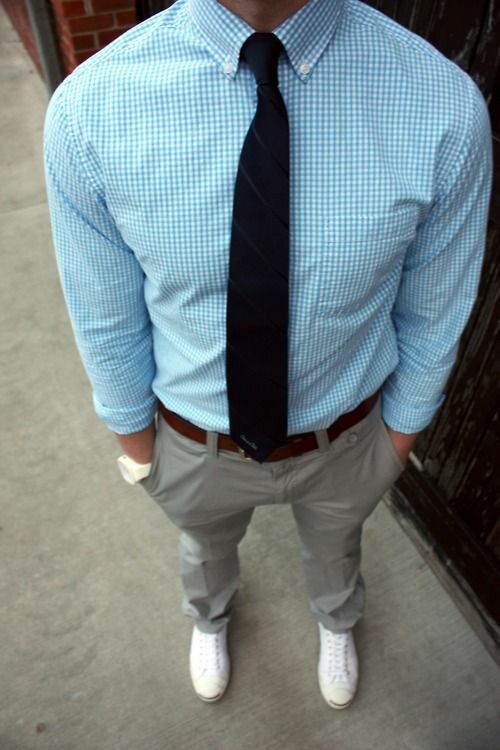 Another nerdy graduation outfit to wear in the winter for guys. Full-sleeved black sweater with jeans that look good on most guys. A collared dress shirt and dark tie. 18. Wear it, or take off the coat, you are going to look good in this outfit idea. The gray tie is simple, but it goes well. White dress shirt, dark trousers, a dress watch, and black belt. Roll down the sleeves and you’ll look very classy. Roll up the sleeves after graduation for a cool, rugged but classy outfit. 19. Colors of the tie matched with the shoe. Brown band of the watch and belt complements the look. A pair of brown wingtip boots, brown trousers, brown plaid tie, blue v-neck sweater vest, and white collared dress shirt. 20. A blue shirt for an outdoor event. The light brown cotton trouser for a sunny day. 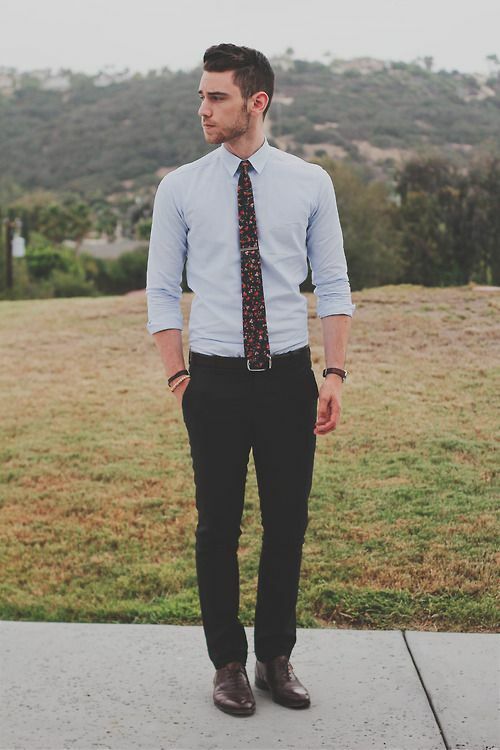 Wear a tie pin and watch to look even classier. Bring some sunglasses with you to look even cooler. 21. Small checks look best on tall men. The blue tie and a deeper shade of blue for the pant will work with this. 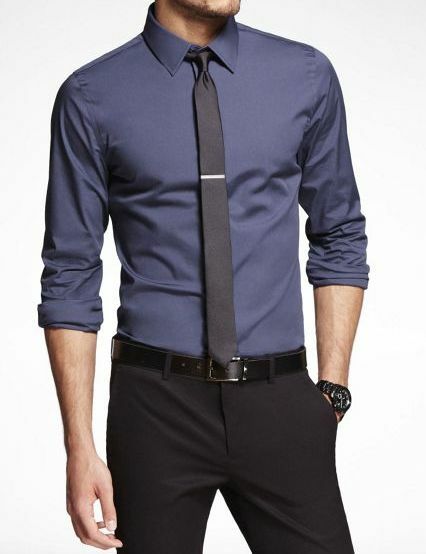 Add a brown belt and silver tie pin to finish the graduation outfit. 22. Another floral tie for the graduation day with formal, black cotton pant and brown shoe. 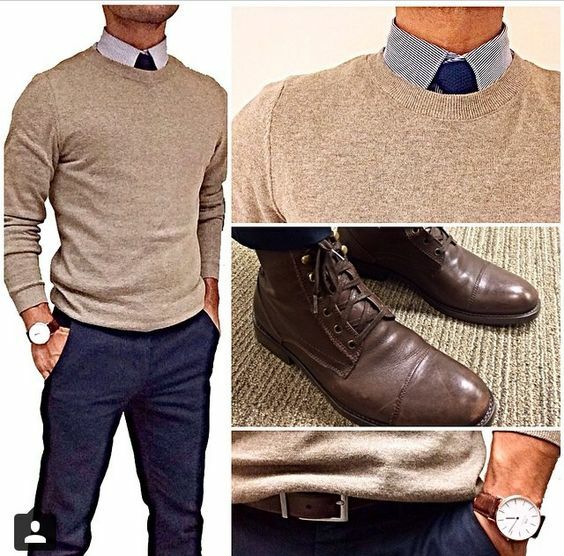 Add a brown belt to match the oxford shoes, a watch and some bracelets if you prefer. 23. 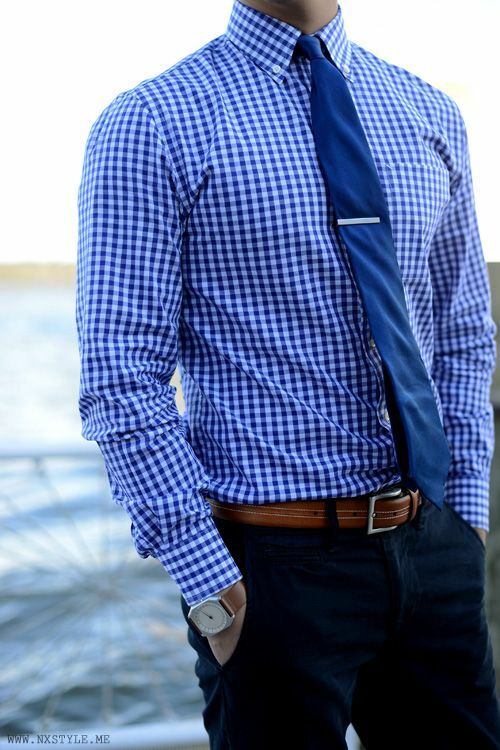 A buttoned collared shirt in blue with dark blue pants. Dress watch and brown belt to match. The accessory that really finishes this graduation outfit is the tie pin. Don’t forget to buy yourself one. 24. In this picture, the man is wearing blue polka socks and a matching blue polka dotted tie. The shirt goes well with the tie too. Brown shoes, brown belt, and a sports watch. Don’t forget the tie pin! 25. A conservative, “smart” looking outfit for graduation. White works well both for women and men. 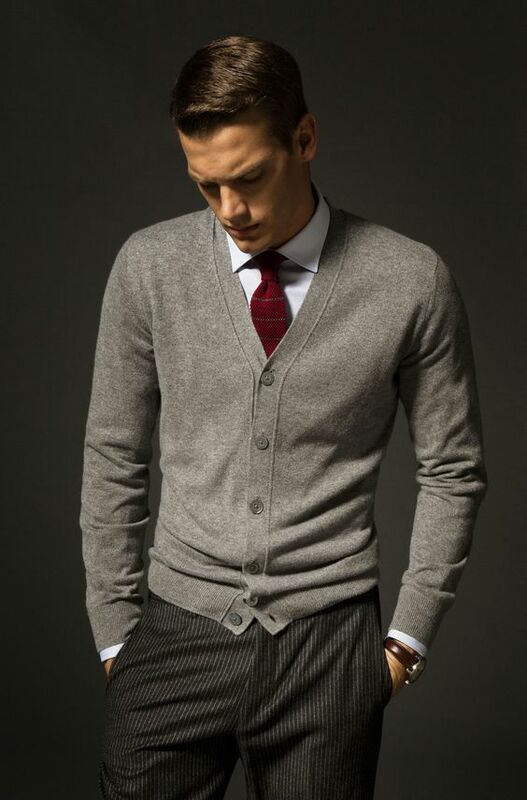 The sweater and cotton shirt is in white (or a very light shade of gray), while the trouser is a darker shade. Wear a maroon or red tie for accentuation. 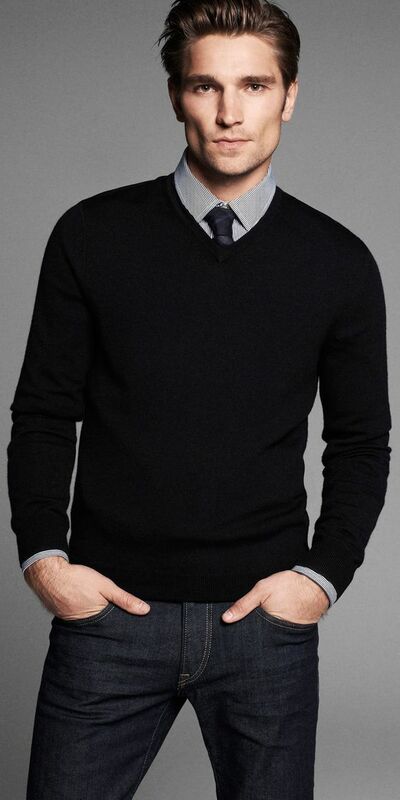 Wear this outfit with or without the sweater vest. 26. Another graduation look in black suspender and coat. 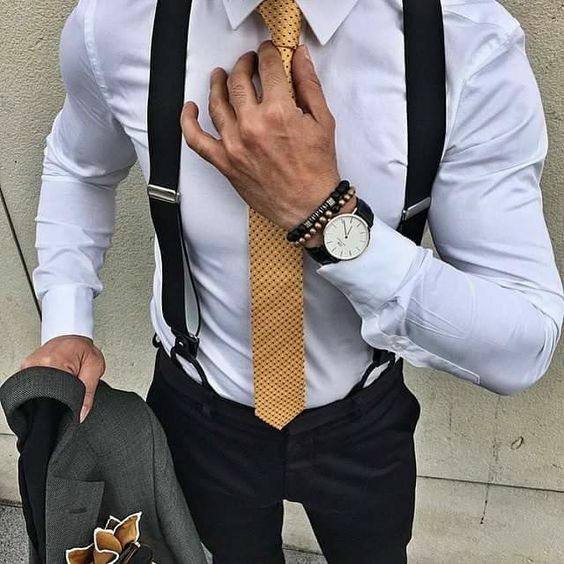 (Click here for suspender outfits for men!) Contrasting color of the tie makes it come out well. Gold tie, watch and bracelets, collared white dress shirt, and black trouser pants. 27. More formal appearance with blue check shirt and gray cotton trouser. Add some drama with a different colored tie. A black tie, silver tie pin, brown wingtip oxford shoes, grey trousers, and a brown belt. 28. 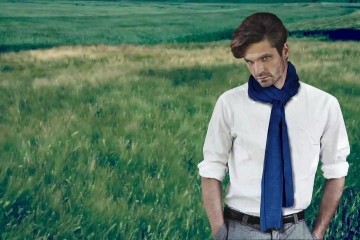 Linen is a great choice. It is comfortable, looks chic, and is perfect for the big day. 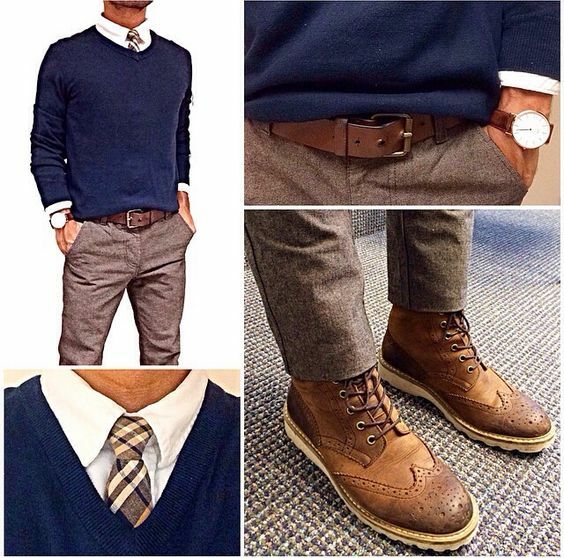 Dark navy blue trousers, light brown camel colored boots, and stripped tie. 29. The man in black, looking smart and handsome. The red satin tie is the perfect contrast. 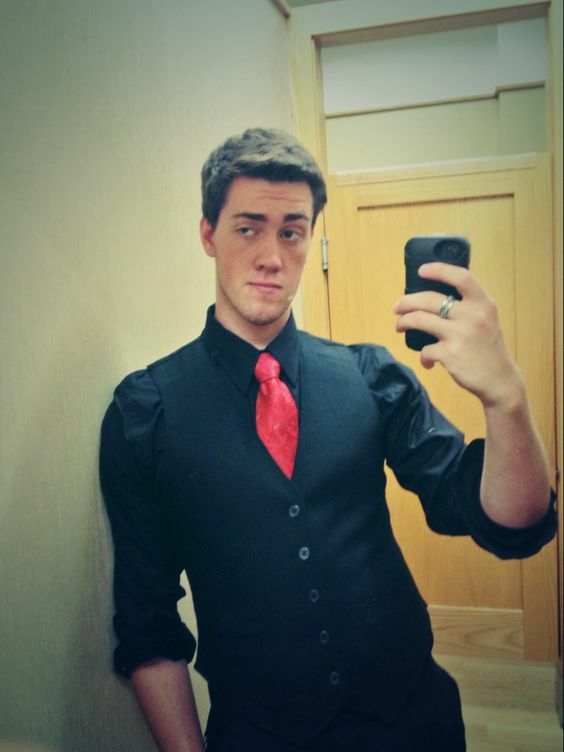 Black waistcoat vest, black dress shirt, and bright red tie. 30. Is blue the most formal color? Could be! 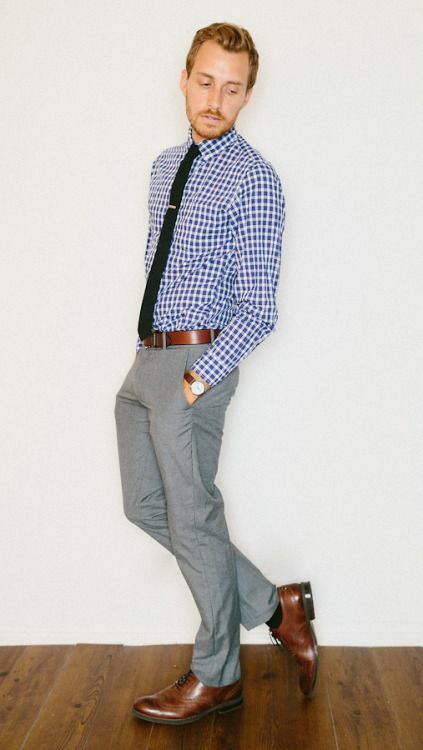 Go for this outfit with brown shoes and a black or deep blue tie. Wear with a dress watch and black tie to complete the graduation look. And there ya have it! 30 of the best graduation outfits for guys to wear on the big day! When you graduate, you will be walking the stage with your robe and cap on. Since it’s a formal and special occasion, you will need something formal to wear. But what type of formalwear? If you’re graduating in the summer, you will need something light, since you will be putting the robe over your outfit. If you’re graduating in the winter and if you’ll be outdoors, you will need something more heavier.